The Tip Over Trunk is a versatile illusion prop to make a person magically appear. 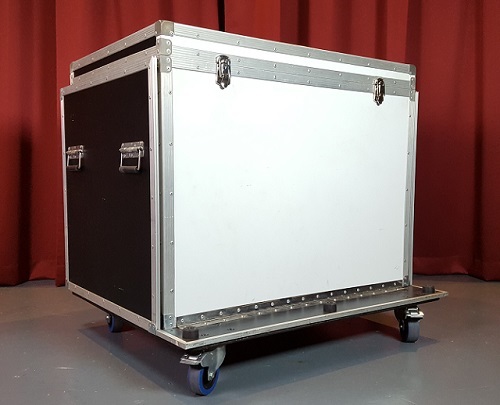 This illusion plans pdf package details the fabrication of a modern Tip Over Trunk illusion built like an ATA flight case. The Tip Over Trunk is a very practical illusion that allows you to make a person appear. It is ideal to make VIPs, celebrities and corporate executives appear as it requires minimal rehearsal on their part. This set of plans details the construction of a modern Tip Over Trunk that can be performed surrounded. Also included is a bonus “Escape Vanish Illusion” that was featured on The Amazing Race Asia and The Amazing Race Israel television shows. The dimensions given will fit a person 6ft tall, 176 lbs. (80kg). However, alternative recommendations are given if a larger trunk is required. Any experienced illusion builder or ATA case maker will be able to build this prop. This is a previously unpublished illusion plan and is not available in any other books. Includes building plans and photographs.